Jeff is the supervisor of product selection and our holding facility. 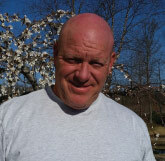 Jeff has 26 years’ experience in the landscape and nursery trade within the Mid Atlantic region. His responsibilities are to make sure all the products meet customer expectations and is the final eyes on the product as the trucks are loaded. Jeff also has extensive inventory experience and will help us in this area as well.